All of Hindu philosophy and theology is based in sacred scriptures called the Vedas and the Upanishads. But equally valuable lessons are learned through puranas (God stories from the ancient past) and through Hindu epic stories from the Ramayana and the Mahabharata. Stories – thousands of them – within more stories have helped keep the faith vivid, challenging, and alive through many thousands of years. Topics to be covered include getting acquainted with the Vedas i.e taking a peek at core ideas of the Vedas, the Vedas in religious practices, recognising the authority of the Vedas, and delving deeper into the Four Vedas; the Samhitas, the Upanishads, Bhagavad Gita, and the Ramayana. Below is a Lego brick structure diagram of all scriptures in Hinduism. Each type of scripture, denoted with an abbreviation in square brackets e.g. [RV] for Rigveda, will be updated to this site in stages. 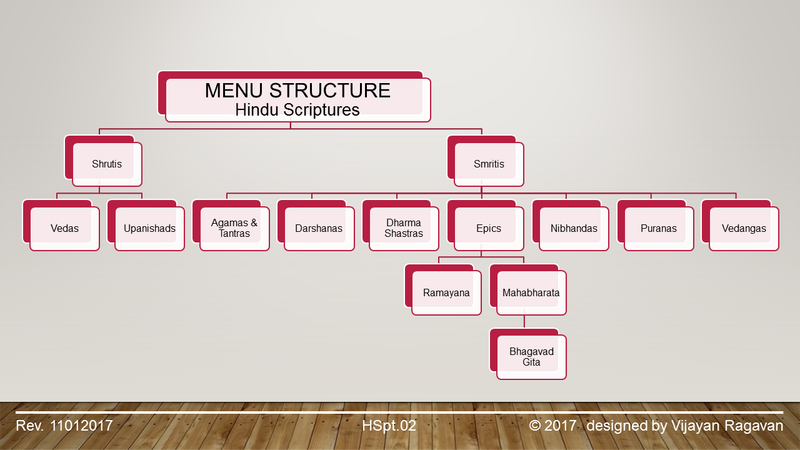 The Reader will find the structure of the webpages for all the Hindu Scriptures as shown in the following diagram. Each of the webpages shown in the diagram above will provide details about each individual scripture.